Many commercial buildings have flat roofs, and if you find yourself responsible for a flat roof, you have options. Innovation has brought us many different types of flat roof coatings, and Tim Leeper Roofing is proud to provide acrylic coatings and beyond. If you’re wanting to get your roof replaced or repaired, we are the ones to come to. We will sit down and take the time to understand exactly what you need and what your budget is. We will also discuss other factors. In the next few blogs, we’re going to discuss the pros and cons of the most popular types of flat roofing materials. Acrylic coatings are water based and don’t require components to be mixed together. 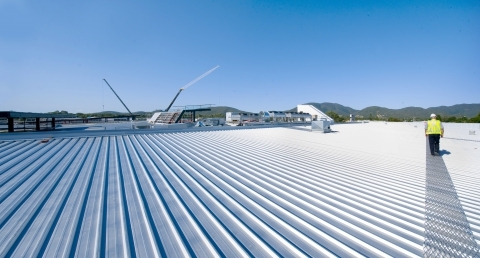 The advantages of acrylic roof coatings include low flammability and low toxicity risk. They also are the only coatings to provide unique color options that you can match to your building. The disadvantages of acrylic coatings include its vulnerability to ponding water. If water ponds on acrylic coatings longer than 48 hours, the coating will begin to go liquid again. Additionally, they are applied in layers, and the temperature has to be in the correct range or the material won’t set correctly. Whether you own your business’s building or you are the property manager, keeping the building’s roof protected is a top priority. Because the roof is any building’s first defense against all the elements, getting professionals on your side can be a huge advantage. At Tim Leeper Roofing, we know how crucial your roof’s role is in your success. We feel privileged to bring knowledge and experience to your commercial roof, and we being complete dedication and transparency to every customer. We want you to feel like you can trust us every step of the way. Let us show you how easy getting a great flat roof can be!